You are Eric the Brave, the sole defender of a castle under attack by an army of orcs, and your mission is to stop the orcs from invading the castle any means possible. Sounds like a walk in the park, doesn't it. You're a player, you're familiar with this sort of thing, right? First of all, there's four sections which you must pass to complete the game, each harder and slightly different from the previous one. You only have two lives to go on, with 9 energy points for each life to spend, so there's little margin for error. As if that weren't enough, you have 6 difficulty levels to choose from, so the challenge doesn't end in one go. First, you're thrown a bunch of sword-and-hammer-wielding orcs at you, accompanied by some archer orcs shooting a massive amount of arrows at you. This lot is trying to raise ladders and climb the castle walls to kill you and your lot. Next, an evil sorcerer orc appears and commands his accursed spirits to attack you. The sorcerer stands in one place, so it should be easy enough to send him off to meet his maker, but he takes a surprising amount of damage. Then there's the dreaded Stone Warts for you to fight against, and even later on the clever Ninja Orcs that climb the castle walls without the help of ladders, and the gigantic Demon Trolls that shoot lightnings and drain your energy even when you're not getting directly hit. Starting to sound a bit scarier, eh? Well, the game would otherwise be a nice arcade action siege-a-like, but the game mechanics make it surprisingly difficult. First of all, your brave knight runs like a zombie on ice with skates, it's a bit more difficult to handle him than you'd expect. Second, you will only have one weapon to use at a time: a rock, a sword and a bucket of burning oil. Each of these will have to be picked up one by one until your storage is out, and you will have to wait for a certain time for the oil to become available. The rest of the mechanics are more details for the playability section. In the main screen, you can choose to compete with 4 players, which can be fun and even slightly educational, if any of your friends knows any good tricks that the others don't. I can't honestly remember ever playing this game before, even though it certainly looked very familiar when the title was first brought up. I know I've played something very similar, but easier - just can't remember what it was. It's not a bad game by any means, it's just a bit more difficult than expected to get into. Also, the playability doesn't necessarily allow for longer sessions, because the frustration can kick in quite early on, if you're not familiar with all the tricks. This would have been a difficult one, if the Atari version hadn't been a cartridge-only release. Both the Spectrum and Commodore had 4 tape releases, which would've made the comparison slightly bothersome, especially if you count this as somewhat of importance. Apart from the Atari being the clear winner here, the Spectrum release is the only one with a loading screen, which is pretty nice. There's no .tap image of the C64's Top Ten re-release, but judging by the Spectrum version of their re-release, it could be the same as Sparklers' release on the C64 as well. Left: ROM loader from Creative Sparks and Compulogical. Right: Burner variant loader from Sparklers. I'll say this before anything else: I thought the game was superbly awkward at first. After about 15 minutes of trying every version, I still couldn't fully get the hang of it, which should mean that the game is either rather counter-intuitive or that just very different from anything else. I'll go for the second option, because I had to read the manual and some comments about the game on the internet to get any sense into my playing. Having as good a score as it has on every platform couldn't be for nothing. them with your untrustworthy broadsword. However, you have the ability to inflict a super-blow with your sword by pulling the joystick towards you (obviously, down), and pushing the fire button, but you are only allowed a limited number of these. 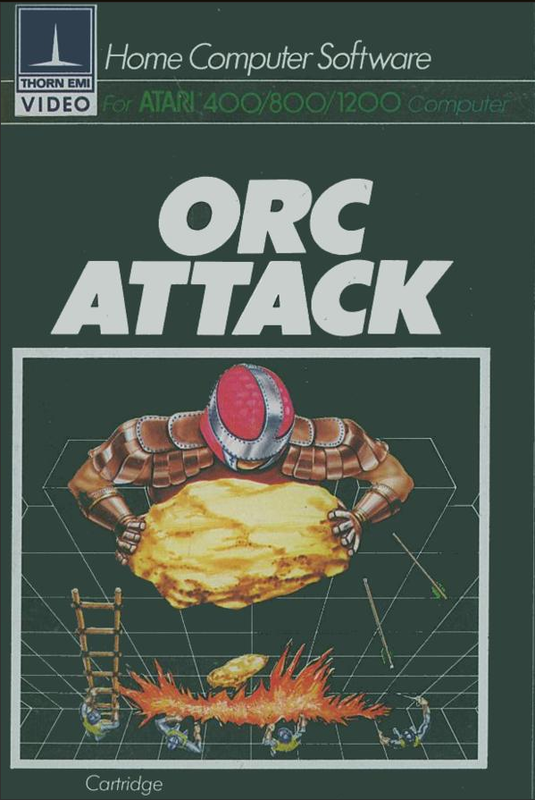 As early as this game was originally released, Orc Attack still has enough going on for it to have a good use for the manual that came with it. In the section "Rules of Orc Attack" are mentioned some very good tips, without which you would certainly be having a lot worse time. Let's get comparing, then, starting with the ATARI original. Your knight has a very slow acceleration for running full speed, and he slows down a bit similarly. You can push the fire button down to slow your speed and keep it down to aim more accurately. In this version, you can drop the rocks and oil buckets when there's half of the item colliding with the blocks on top. Also worth noting is that the orcs build the ladders piece by piece before getting up to your height. 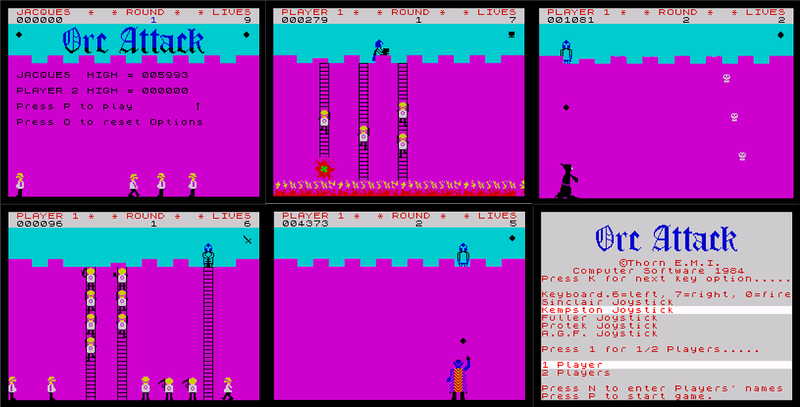 In the SPECTRUM version, the orcs lift up the ladders at once, so you have to be very much quicker about killing them off. However, it feels like the fire button control isn't quite as responsive as on the Atari version, but it could be that I'm just bad at this game, although I have to say, many times when I let go of the fire button while aiming on the move, and having a good position, the idiot knight didn't drop the rock, although he's much faster at stopping. With the burning oil bucket, he's even less willing to let go for some reason. Also, you don't have the special sword attack thing - you can only move left and right and use the fire button. Not that it has helped all that much in the other versions, but still. A good thing worth mentioning here is the default level of how the enemy batches are randomized, compared to the other two. A bad thing would be the lack of another life for the knight - you only have one, with the familiar 9 energy points. The COMMODORE version plays otherwise pretty much like the Atari version, but the aiming is made to be anally precise. You can't have one pixel over the defence blocks, because your knight will not drop the rock/oil if the aim is not precisely off them. Other than that, the orcs feel slightly faster and angrier in this version, and your knight rolls around a bit longer after getting hit, but that's about all the differences I can think of from the Atari, playability-wise. It's still enough to make it the least playable of the bunch. It's a tricky one. I sort of like the SPECTRUM graphics the most, because it's the most detailed and has a higher resolution in graphics, but it has a weird cyan and magenta based colour scheme, which is a bit strange considering the castle is supposed to be built out of rocks. 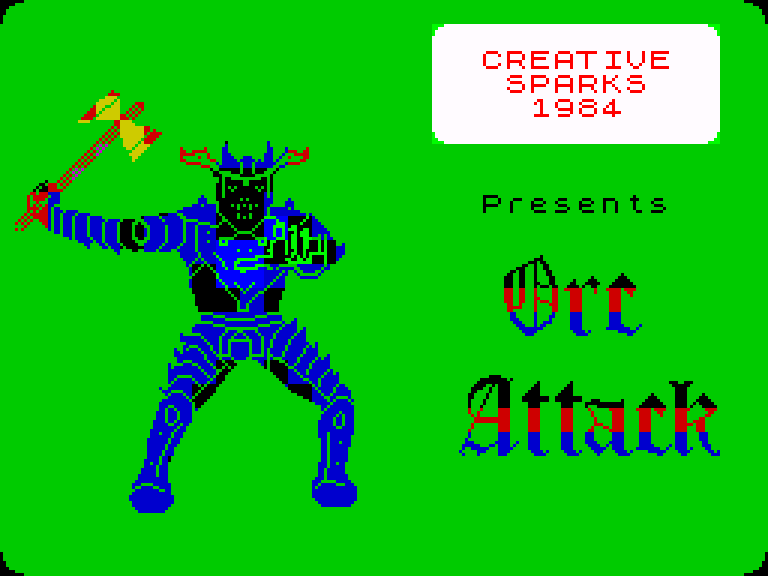 So basically it looks like a CGA DOS game, but then again the orcs are yellow, white and black, your knight is blue and black, and every now and then there's some yellow and red in other enemies etc. It's just a strange looking combination, but somehow it works well together, even if it doesn't look close to the original. Also, the way the your knight and the orcs move is based on character blocks, so the movement has a slightly unnatural feel to it. But regardless of that, the game plays pretty much like it should - it only looks a bit off. The ATARI original and COMMODORE conversions look almost exactly the same, apart from the font and the differences in basic palette. The orcs are green and black, the walls are grey as stone and the sky is dark blue, and your knight has a black helmet, human-like face and brown... whatever he's supposed to be wearing. The sorcerer is of a different colour every time you encounter him, unlike in the Spectrum version, where he's always black. Also, his evil spirits raise up slower than in the Spectrum version, and are bigger, thus easier to get stuck into the defensive blocks. This graphical difference actually affects the gameplay in a serious way, so I have to take some points off of the Spectrum version. All in all, I'd say the Atari version is the most playable due to its graphics, but loses to the Spectrum version in detail. We'll have to tie this one. Let's start with the SPECTRUM version, because it usually places last with a clear lack of effects. On this occasion, however, we do get a lot of sounds - except for one thing: the "get ready" melody. It's not important, and the lack of it even makes the game quicker to progress. Anyway, you'll get a sound for your walking/running, for dropping rocks and oil, for the oil burning, for your sword fighting, for killing enemies and even all the enemies have their own distinctive sound effects for shooting arrows, summoning evil spirits and whatnot. So it's a very rich sound environment, although it still sounds like a PC beeper. How does it compare to the others, then? The only two things that the original ATARI version has got it better, is the "get ready" melody if you prefer to have it (it's cheesy, but I like it), and then there's a static rhythm going on in the background, probably indicating the hordes of orcs marching towards your castle. All the other sound effects are pretty similar to the Spectrum version, and there's really not much to say. Finally, the COMMODORE version seems at first to tie with the Atari original, but I noticed later on when you get to fighting the sorcerer, that every time you hit him, the sound effect gets progressively higher in pitch, thus making it clearer when you should be expecting for him to die. It's a nice additional indicator to go with the primary colour flashing with every hit on the sorcerer. In all the other basic sounds, it may not be quite as rich as the Atari version, and has a more Spectrumy quality to them. Had I gotten any further with the C64 version of the game, I might've come across other different sound effects, but just for that one extra twist to the effects, I'll give it the highest marks. It's one of those games with the steep learning curve, which usually means that you either master it quickly (by reading the manual) or you try it for a few minutes and forget about it. At least, that's how it would go in today's world, where you don't have to learn anything by trial and error, and everything's instructed for you on screen, or by hand in real life. Because I had to learn how to play the game, I disliked it very much at first, but grew into it after a few tries and by reading enough about the game to learn about it. I can imagine it having become a cult favourite because when you got a game back in 1983 (or even 1984), you would have to play it, play it again, and then play it some more, because you would probably have very little choice. Now the internet is full of interesting stuff to browse through, and most of it is easily available for download and have a quick go to see if you like it. 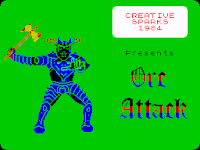 It created enough following to actually have a remake/sequel for the Amiga, called Ork Attack: The Return, but apart from me showing you some screenshots, I'll not go into it more than that. Since playability is more important than loading times, I've placed the Spectrum version above the Commodore version. And still, it's rarely about the total sum of elements, it's the overall feel and preferences, as we have so many times before seen. To me, having played this game now probably for the first time ever because I was suggested to do so, it's a strange situation. In my mind, I know that the Atari version plays the best and is exactly as it should be, but the Spectrum version has the most charm and it plays well enough, even sounds good enough that it can't be but my favourite of the three. Still, none of them are really all too bad, so you are all definitely recommended to get a copy of this game, whatever is your machine of choice. cover art from the Atari 8-bits. Only now, I noticed that this game might have been originally a Thorn EMI release on the Atari 8-bits; the confusion is still there due to every advertisement being one for the Creative Sparks version. If anyone can confirm this new information to be correct, I will change the entry title accordingly. Thanks again to fog for suggestion. Next time, I'll be posting the second part of my version of a History of Finnish Games, after which I will again continue with my comparisons.